One of Nikol’s great joys is the fun, growth, expansion and challenge that accompanies a group of people when they come together to support each other in growth. These sessions are incredibly deep and meaningful and a lot of fun! Participants experience exceptional growth and progress. There is something incredibly magical that occurs within a small group when everyone commits to show up authentically and hold each other in a safe, supportive and yet challenging and growth-oriented atmosphere. Nikol has passionately and exceptionally led numerous small groups. Including a collaboration in a small group called Life Chats. 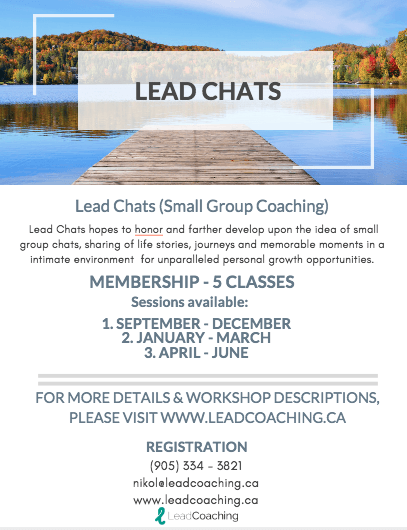 Lead Chats hopes to honor and farther develop upon the idea of small group chats, sharing of life stories, journeys and memorable moments in a intimate environment for unparalleled personal growth opportunities. Meet weekly for a 5 sessions, follow one of my well-established workshops where we can go high and deep into “the work flow and really get to the bottom of any underlying concerns. Lead Chats is Offered to the community at a affordable Membership price. Membership includes 5 classes. (Sessions run Sept-Dec,Jan – March and April – June).